I'm working with non-atmel board using at91sam7s128 , I tried the monitor program with board option : at91sam7s128 and noboard but neither of them works they are not responding ?! and in windows I installed the driver and board is recognized in serial port category . So if my computer recognize the chip and SAM-BA therefor do every thing must be ok ? I used 31 ohm resistors instead of 27 ohm for DP-DM . I used 12pf capacitors instead of 15pf for DP-DM . I used 1.47k resistor in pll RC loop instead of 1.5k .which maybe sounds good as what the pll calculator says . and I used 12pf load capacitors instead of 10pf load capacitors for 18.432MH crystal . is there any thing could help me to indicate the problem ? also I have some fears about FDN360P maybe it is slow in switching , but datasheet didn't said any things on how fast pulling up will be . 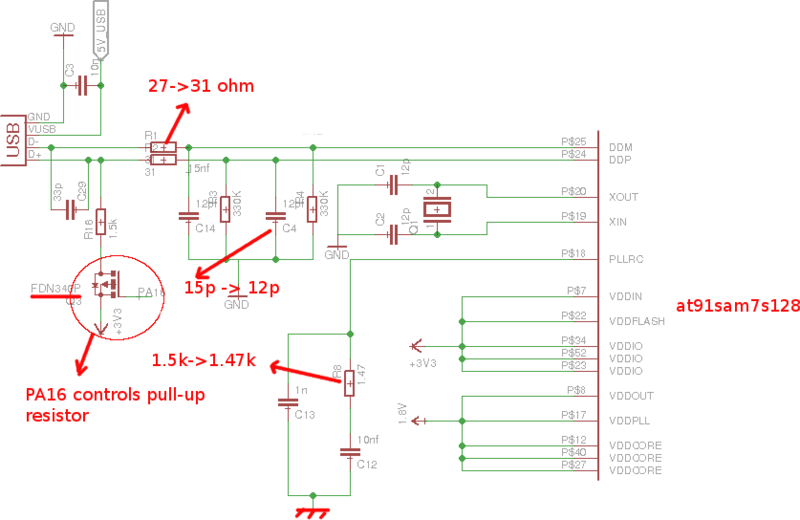 If your crystal is 18.432 MHz, it may be impossible to create a proper 48 MHz (+/- 0.25%) USB clock from it.